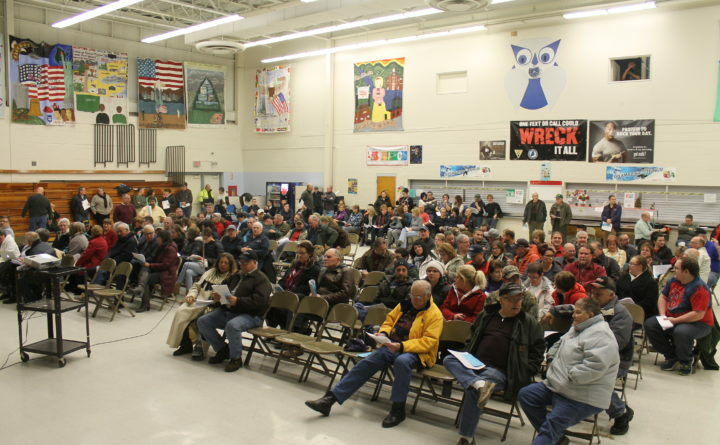 Residents assembled at the fifth school budget special town meeting at the Madawaska Middle / High School cafeteria in this Dec. 19, 2016, file photo. Maine public schools have seen drastic declines in enrollment over the last decade as many communities around the state have lost population as a result of changes in the economy. Between 2007 and 2017, about two-thirds of schools, 392 of 592, saw a net decline in their student populations. A Maine Focus analysis determined that every county in Maine has seen a net decline in public school enrollment, led by Lincoln and Aroostook counties. After having 11,380 public school enrollees in 2007, The County saw that number drop to 9,287 by 2017, a decline of more than 18 percent. Androscoggin County lost the least amount of students over the same span. It had 16,065 students in 2007 and 15,926 in 2017, a drop of less than 1 percent. One of the hardest hit schools, Madawaska Middle/High School in Aroostook, lost 43 percent of its students between 2007 and 2017, declining to 226 from 403. The loss of students has forced the school to make major changes, said Gisele Dionne, superintendent of the Madawaska School Department. Even though the district serves fewer students, many costs such as electricity, heating and transportation remain unchanged, further stretching the school’s budget, Dionne said. The decline in students has led to budget cuts in part because state funding is based on enrollment, forcing the district to eliminate many staff members, extracurricular activities, course offerings and even buses. It’s also seen voters reject multiple budget proposals. Madawaska Middle/High School lost 10 out of 26 teachers in the last decade, about 38 percent of the teaching force. It stopped offering Spanish and several other classes. It used to have 12 school buses, but half of the fleet broke down, and the district didn’t have enough money to fix them, Dionne said. So it revised school bus routes that resulted in longer bus rides for some students. Beginning this school year, some students are picked up as early as 6:40 a.m. to make it to school on time, while others don’t make it back home until around 4 p.m, Dionne said. The Madawaska School Department is sharing a $500,000 state-funded grant with two other northern Aroostook County school districts — SAD 33, in the St. Agatha area, and SAD 27, in the Fort Kent area — to help fund a new regional high school and career and technical education center, while maintaining each community’s early childhood to eighth grade schools. Five-year cost savings are estimated to be more than $900,000. And in recent years, schools from the three districts have shared teachers for subjects such as band and health. Dionne is hopeful that the districts will succeed in working together, she said, but stressed that regionalization may not be the solution for other districts.